Brisbane pipped City for a place in the Asian Champions League after City lost to Perth in the final round of the season. Externally, clubs tout ACL qualification as a major positive but behind close doors, one wonders whether this is truly the case? ACL qualification is almost a death sentence for chances of A-League success the next season. Melbourne Victory have made the ACL group stage on five occasions. During those five seasons, they only made the league top four twice – finishing second in 2010 and fourth in 2014. 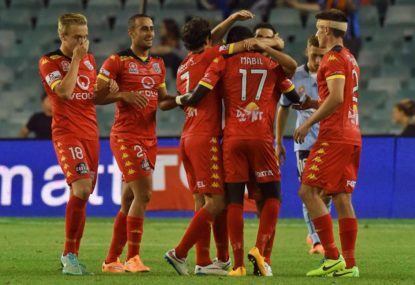 Adelaide United have also qualified for the ACL group stage on five occasions. They made the top four only once in those five seasons, finishing second in 2007. This is for several reasons, but the main one regards the clubs’ playing rosters. The qualifying team only enters the ACL in the following A-League season and thus squad changes can have a big impact on the quality of the team contesting both competitions. Adelaide won the Championship and Premiers Plate last year but after losing a host of players in the off-season, an inferior squad finished second last in the league and exited the ACL at the group stage. Adelaide were dead last well before the ACL group stage began, suggesting the squad was short in quality, which led to an early ACL exit. The timing of the ACL means there are midweek fixtures during the run-in to the end of the domestic season. Group stage games often take place during the finals series, which can mean travelling to Asia in the lead-up to some of the biggest domestic games. A-League squads lack sufficient depth to manage the travel demands, making it tough to battle on both the domestic and continental fronts. So is it worth ‘tanking’ to avoid the ACL? Not at all. ACL qualification is a cause worth fighting for. Although it lacks the prestige of its European counterpart, Asian football will be integral to the future of Australian football teams. This will be even more so if the Chinese Super League continues to lure the likes of Didier Drogba and Oscar away from bigger European leagues, thus continuing to raise the profile of Asian football. Western Sydney and Adelaide have shown that ACL success is not an impossible dream. While statistics show that the vast majority of teams do poorly in the league when juggling ACL commitments, there are exceptions – Melbourne Victory 2010, Brisbane 2012, Adelaide United 2007 and WSW in 2014. The key to maximising success is preventing a successful squad being gutted in the off-season. Do this and a successful tilt at both competitions is possible. The tricky part is navigating the salary cap, which cripples clubs from obtaining and retaining the services of their best players. Repeated ACL campaigns, coupled with success, can increase the standing of A-League clubs both in Australia and Asia. Becoming a bigger player in Asia will hopefully lead to better foreign players choosing to play in the A-League. Off the pitch, it can open the door for sponsorship opportunities and provide avenues to increase revenue. ACL qualification is something to strive for, even if history suggests it is a poisoned chalice when it comes to league success the following year.